One of my favorite pizza's is Giordano's stuffed pizza. A deep dish pizza filled with toppings and cheese with another layer of crust on top and more sauce and cheese? Oh, Yes! 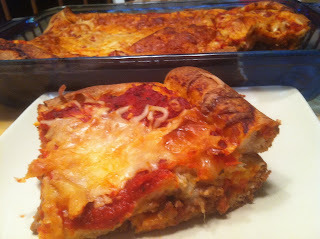 I decided to create my own stuffed pizza at home but in casserole form. It was super easy and BEYOND good! You have got to try it for yourself and I'm sure you will agree! Meanwhile, unroll 1 pizza dough, press into bottom and halfway up sides of prepared baking dish. Sprinkle with 1 cup cheese, top with 3/4 cup pizza sauce, and sprinkle pizza toppings evenly over sauce, add 1 more cup cheese. Unroll and place second pizza dough on top. Press bottom and top crust edges together to seal. Make a few small slits in top crust. Bake 15 minutes. Remove from oven, pour remaining pizza sauce over crust and sprinkle with parmesan and remaining pizza cheese. Bake an additional 8 to 10 minutes, or until crust is browned. Let sit for 5 minutes before cutting. Enjoy! Looks delish! I'm definitely going to make this! What I love about this recipe is that its pizza done easy! I am going to make this with Pillsbury Gluten Free refrigerated pizza dough!